Hy-Lite is proud to offer the first block windows in operable vinyl frame. Casement windows add a new dimension to block windows. Open the window for outdoor viewing; close window for privacy. Hy-Lite windows feature corrosion resistant, easy-to-use operators and locking systems. Our casement windows are fitted with the latest multi-point locking hardware. The “zipper” effect of multi-point locking dramatically increases security and weather tightness. And of course, all operable windows come with a removable screen. Easy Installation: All windows arrive as completely prefabricated and glazed units. All Hy-Lite windows come with attached nailing fins for easy standard installation. Ten Year Limited Warranty: Hy-Lite has the confidence to offer a Ten year Limited Warranty. This warranty guarantees your window won’t leak and the blocks won’t yellow. 75% Lighter than Glass block: Acrylic blocks make for a lighter block window. No extra reinforcement is necessary, so you can have the beauty of glass block places where heavy glass is not practical. 35% More Energy Efficient: As heating and cooling costs increase, homeowners are becoming concerned about the thermal efficiency of all building products. Hy-Lite answers those concerns by offering both vinyl framed and thermally-broken aluminum framed windows. Safety Glazing Approved: Hy-Lite Block Windows are perfect above bathtubs and shower walls. 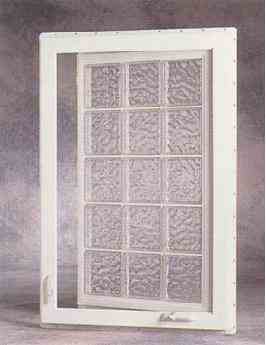 And because they are safety glazing approved, they are not only safe, but are accepted by most building codes. High Quality Virgin Acrylic: Hy-Lite uses the highest quality acrylic for its block. This acrylic won’t yellow and resists scratching. Airtight Sealed Blocks: Every Hy-Lite block is sealed airtight, to prevent internal condensation and to preserve the structural integrity of the window.